Abstract -Modern day gadgets which use Brushless motors for extremely high speed application make use of Electric Speed Controller (ESC), which is a circuit to drive the BLDC motors by converting DC voltage into an equivalent of a 3 phase AC voltage with the help of very fast switching mosfets, and microcontroller to control their switching . This project describes the design of a circuit suitable for high speed switching application and focuses on the configurational elements for fine tuning of this circuit for a particular application. problems and suggesting suitable solutions for them. current provided or supplied is restricted by the current sourcing or sinking capabilities of microcontroller or microprocessor, then the switching time further increases creating an increased level of problem. MOSFET drivers have capabilities to supply high voltages and can source a lot more current than microcontrollers which significantly increases the switching speed of the target MOSFET and also at the same time have small gate capacitances which increases there speed too. Thus overall the whole process of switching becomes a lot faster than without using the driver circuitry. Referring to figure 1, we can explain the working of Schmitt trigger. Consider Vin to be 0V, then Q4 and Q6 transistors will be ON and Output will be HIGH thus switching Q3 ON and thus making source voltage at Q1 close to Vcc. Now when the Vin becomes greater than threshold voltage of NMOS, Q2 turns ON giving rise to a voltage divider network between Q3 and Q2 and makes source voltage of Q1 to be Vcc/2 and thus the switching occurs at Vcc/2 + Vth1, where Vth1 is threshold voltage of NMOS. This was switching from High to Low, now when switching from Low to High similar actions take place at PMOS side and voltage reference becomes Vcc/2-Vth2 where Vth2 is the threshold of PMOS and thus the reference voltages at 2 different transactions are different, providing a higher noise immunity to the whole circuit. elements in between U2 and U3 and part C contains elements to the left of U3. 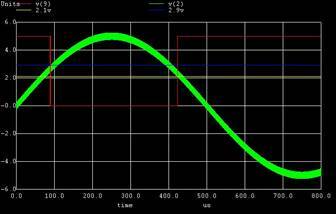 Part A is basically the noise simulation and its removal by using Schmitt trigger. 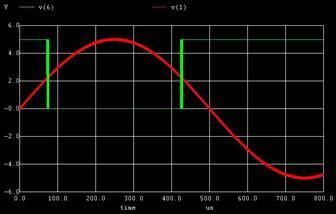 The voltage source with high frequency signal represents the simulated noise. Inverter with some slanted hysteresis symbol U1 represents the inverter with inbuilt Schmitt trigger. And U2 is placed to remove the inversion due to Schmitt triggered inverter. Part B contains the additional circuit to control the threshold voltage of the switching of circuit. The current source is the biasing circuit for transistor Q2 and thus by controlling the current parameters we can make changes in the circuit for changing the voltage levels of the circuitry. Part C is another inverter at output side using CMOS circuit so as to offer high impedance to the circuit following the MOSFET driver which most probably will be another MOSFET. In Fig 3 we see the output of an inverter without Schmitt trigger and its corresponding output with Schmitt trigger which clearly shows the additional noise immunity presented by Schmitt trigger. In Fig 4 we see the final results in which a high voltage output is produced as the final output of the MOSFET driver circuit. 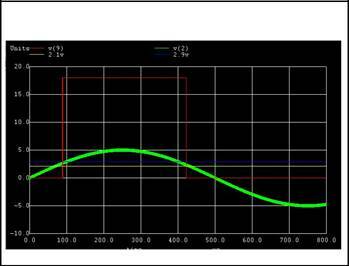 In Fig 5 we can see the effect of changing the bias current of MOSFET Q2. In (A) the current is 50uA and in (B) the current is reduced to 10uA and the results are clearly visible. The decreasing of current has reduced the threshold levels.